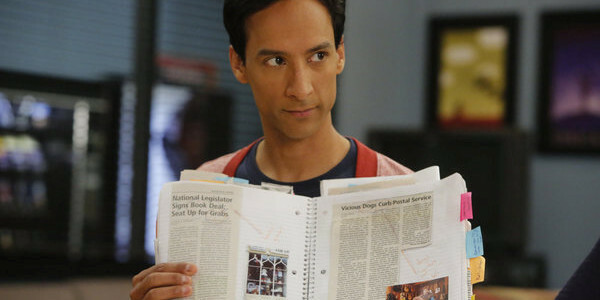 Derek B. Gayle reviews the May 2 episode of NBC's Community. Summary: The penultimate episode of the season (show?) circles back to its roots one last time, in another competent—but not always funny—stab at a unique trope filled with fanservice. We’re at the homestretch now. Season 4 of Community decided not to do much of a serialized story like last season, but it was probably for the best; the last few episodes have been able to throw out some of the best material without worrying about escalating an overarching plot. “Heroic Origins” doesn’t quite live up to the potential it might have had in terms of laughs, but it’s an entertaining 22 minutes that tells a story only Community could have handled. And like the previous episode’s Freaky Friday homage, it utilizes a more obscure, but still undoubtedly well-known (and already kind of tired) trope: the origin story and intertwined destiny. 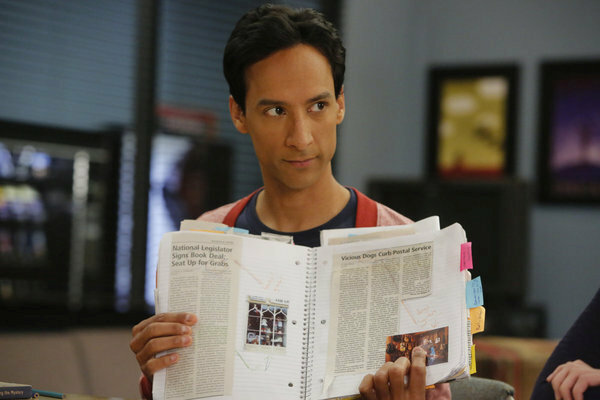 Of course, Community characters already had fairly specific origin stories from the very first episode, so not much new could be presented without mucking up the show’s much-protected continuity. And of course, fans have already found a couple of big errors with how Troy’s injury was presented, but it doesn’t hurt the story that’s being told. And that story is that, yes, whether by destiny or coincidence, the study group affected each other’s lives (and so did that Froyo place), but all that matters is that they ended up here. They might trash Greendale for being a terrible school, and themselves for being terrible people, but the last four years of their lives have been for the betterment of them all, so whatever force brought them together is a good thing. Oddly enough, this seems to be a conclusion to Chang’s overarching series story arc, despite his minimal screentime. While the execution was way too haphazard, the idea that Abed’s acknowledgement that “You’ve always been one of us” could bring Chang away from the darkside is impeccably sweet. It’s one of the better callbacks to past seasons the show has done—Chang’s major motivation in season 2 was all about joining the group—as it provides closure to a core character trait that was valid in being dredged up. It’s way more satisfactory than Chang having another wacky, nefarious plot to take down Greendale come to fruition. The problem, as I said, is that it’s so quick and somewhat random that it doesn’t pack any kind of punch. It’s cool that this silly Changnesia stuff has actually allowed Chang a way to absolve himself of his misdeeds and really start over—in fact, that’s a fairly heady concept that this show could tackle—but it’s far too underplayed to be satisfying. Perhaps if this season had been longer, we could have had time to see it. In fact, that particular criticism of this entire season is exemplified in the episode: many, many gags are solely reliant on referencing classic ones. That completely fits this episode, of course—the origin of Magnitude’s catchphrase or the new first time Dean said “This better not awaken anything in me” were a couple of the funniest moments this week. But references to the characters’ pasts and callbacks to earlier gags have been so prominent in the past 11 episodes that it saps this episode of its energy in context. It’s probably contradictory to say this, because in recent weeks I’ve said how these references have been enjoyable, but the problem is more about oversaturation. “Intro to Felt Surrogacy” and “Basic Human Anatomy” are two of the best episodes of the season, but it’s probably no coincidence that the former pretty much stands alone and focuses on trying new things, while the latter progresses earlier plot points without recycling the jokes. Most of the season has taken the opposite route, and even though many nods worked in their individual episodes, that facet has dragged down the season and lessened any impact “Heroic Origins” could have had. It’s frustrating, because this could have been so much more entertaining if we hadn’t heard rehashes of the show’s own material so often recently. It was fun to see continuity nods in the first couple of episodes, but season 4 has been so neurotically acknowledging that they remember the show’s past for so long that it sadly makes “Heroic Origins” seem like another rehash, even though the idea to use that trope in this fashion is fairly inventive. That said, standing alone, this is a fun and competent outing, and one of the more enjoyable episodes this season. In spite of the negativity, this is still a good episode part of a solid final run of episodes for the season, and it’s something only this show could pull off. It’s not perfect, but it’s trying new things—even if those new things are still not much more than spins on the old—and clearly giving an effort. Circling back to the beginning is always a good thing to do in a final season, and even if the show magically gets renewed, “Heroic Origins” fits into the senior year archetype by both reminiscing about and moving away from the past. Community has struggled about whether it should move backward or forward this season, but at least that struggle has yielded an interesting, albeit highly divisive and admittedly weaker, season to break down. If we do get a season 5, hopefully the show can pick a side (moving forward) rather than staying in this “different but not too different” limbo. Until then, we’ve got one episode left to look forward to…or dread, depending on your perspective. Either way, I’m excited. No spoilers here, but the preview of the finale coupled with the last shot of Dean Spreck’s blueprints for…whatever that was…looks like the final episode of this season/series will be so insanely ridiculous that it will either end the show with the biggest jump-the-shark ever produced, or be a huge, pull-out-all-the-stops blowout that ends the show on a high (but divisive) note. I’m not sure how it could fall anywhere in between. I’m sure this wasn’t the intention, but the idea of “it doesn’t matter who brings us together, as long as we’re together” functions as a commentary on the state of the showrunners at this point. Whatever state the show is in, it’s still kept its core characters a charming little community. I admit that the show isn’t nearly as funny or consistent as it once was, but being able to spend a half-hour every week with these characters is highly enjoyable in its own offbeat way, even with different people at the helm. Much as I harped on too many references, I do like Gilbert being the excuse for Pierce being offscreen so much. The explanations themselves are silly, but the fact that Pierce is spending so much time with his newfound brother is a sweeter change rather than just saying Pierce got shipped off to an old folks’ home or something. Similarly, playing “Don’t You Forget About Me” to call back to the pilot was another good way to utilize continuity and references—it’s not trying too hard to indulge fans, it’s indulging itself a little bit, which in TV is better to do than pandering to (and in turn being inadvertently condescending to) viewers. I’d like to see Annie’s parents and how they’d view her now. Actually, I’m surprised we haven’t seen more parents of characters than we already have. Good attention to detail here with presenting Jeff’s first season hair and lack of stubble against current-Jeff’s flatter hair and increased stubble. Stubble is important when it comes to flashbacks, as this week’s also origin-heavy Arrow showed. 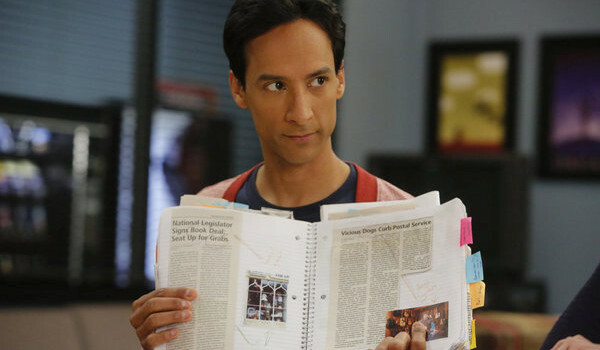 I like how Abed apparently still hasn’t explained the time he almost sawed off Jeff’s arm but will still bring it up. “I had 6 different reconstructive surgeries.